Here - below - is the Nankivell name's meaning, and more - much more ! An early Cornish written-record has it that, in the year 1324 "Lands at St Columb Major were granted to Odoni de Nanscuvel and his wife Rosée"
So we got our surname from this piece of land near St Columb Major - a normal procedure of around those times. There are three pieces of evidence pointing to Nanskeval and its variants (including Nanscuval) being a small area of land just outside the western parish-boundary of Cornwall's St Columb Major. 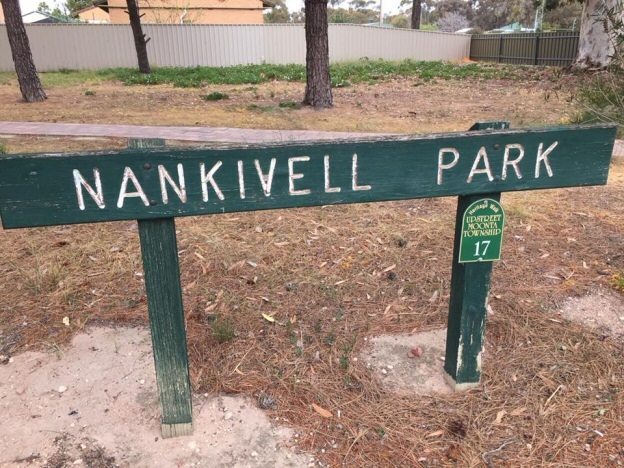 The genealogist who prepared the very detailed genealogy of the name Nankivell for my father Howard Noel Nankivell back in the 1920s, stated the name means “ Valley of the Woodcock”. As the Cornish Celtic word for for ‘Woodcock’ is ‘Keveleg’ this is very plausible. Nans and Nance mean “Valley”. The Cornish language is not dead:- the 'Cornish Language Partnership' reported in 2010 that there are around 300 fluent Cornish speakers who use Cornish regularly, with about 5000 Cornish people who have a basic converstional ability in the language. In 2018 we learn that 77 people passed the Cornish Language Board exam, an increae of 15% over 2017. This rise is thought to be due to the success of the Welsh/Cornish singer Gwenno Saunders (she grew up in a Cornish-language-speaking family) who in 2018 released her first album in Cornish entitled "Le Kov" (a "Place of Memory" in Cornish) with English-language subtitles. In the 2011 UK Census, 273 people in Cornwall listed Cornish as their first language. More here. He quotes the words of “the local bard” as follows:– “You may search in and out, you may hunt up and down, but you won’t find an equal to Mawgan Churchtown. 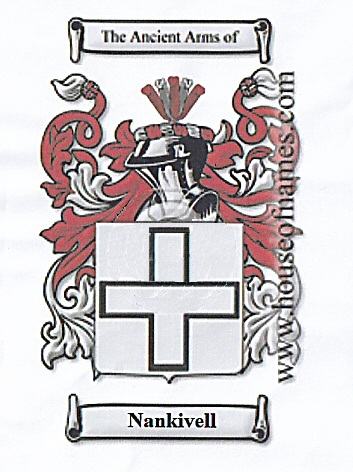 Lanvean and Polgreen and Tolcarne and Trevedras. Lanherne and Nanskival and Gluvian and Deerpark. Trevarrian, Tregurran, Trevena, Carloggas, Trenoon and Bolingey and Mawgan Churchtown”. All underlined names have been located and are close to St Mawgan, implying Nanskival is similarly a place near St Mawgan. Trenoon was very near St Mawgan as a report about the construction of the airfield south of St Mawgan (sometimes called Carnanton Airfield) states that it “engulfed Trenoon”. It would also have engulfed Deerpark. And on Page 40 of this book there are two metions of "Nanskival" where it is written "...Nanskival - which in the old Cornish language means Woodcock Valley..."
Arthur Jewer's 1881 book book "The Registers of St Columb Major, Cornwall" tells us that "The name Nankivell is pure Keltic, and means the 'Glen of the Woodcock' a glen so-called (generally spelled Nanskevall), with its fine old oak wood, lies about two miles from St. Columb". 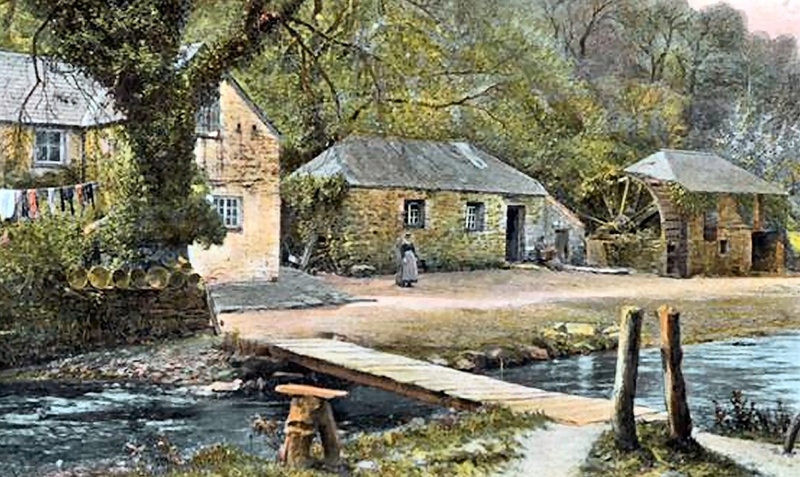 Moreover in Charles Lee's 1903-compiled book "The Vale of Lanherne - Past and Present" the author takes a path through the Tolcane Hamlet then behind the ruined Lawrie's Mill to Nanskival - and the author continues "which in the old language means Woodcock Valley". See below a picture of Lawries' mill. Another piece of evidence is the map found on Page 44 of the hardback “The Book of St Columb and St Mawgan” which shows “A Plan of Carnanton with Nanskivell" from Carnanton Estate Records. 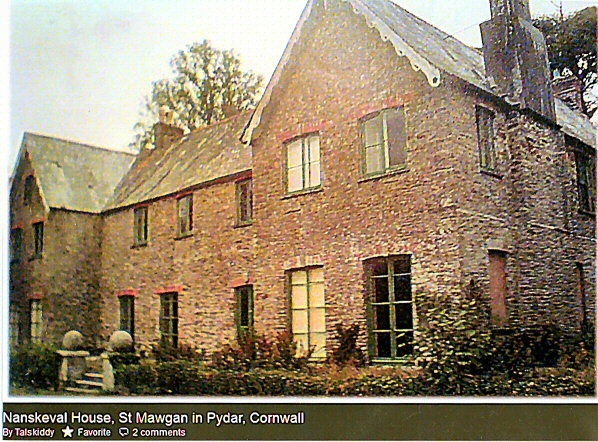 Now Carnanton Manor is close to St Mawgan and about 2½ miles West of St Columb Major. 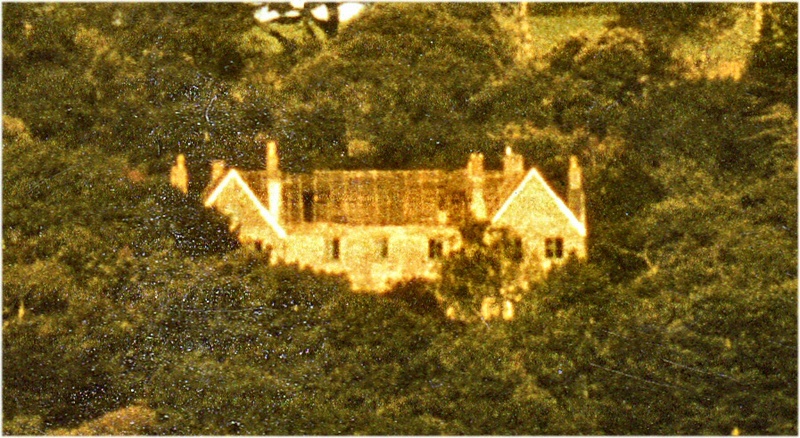 In the recent map shown here, N = Nanscuval (Nanskival etc) whilst the horizontal "H" is Carnanton Manor House - as that it what it looks like from the air. For the Town to win, which they did in 2011, they had to get the silver ball just over/outside the parish boundary anywhere - just get it across the parish boundary anwhere. The quote:- "Sean Johns...broke away and led the chasing pack down to the parish boundary at Nanskival". "The Carnanton Estate included the ancient Nanskeval House which is recorded in 1277 as Nanscuvel. 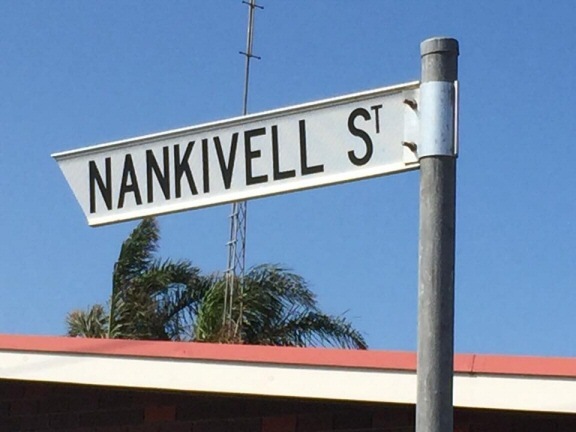 It is thought that the surname of Nankivell and its variants derives from here. Nans means "valley" in Cornish. It has been proposed that Kivell may derive from an extinct Celtic word for "horse" (as there is a similar word in Welsh, though margh is the Cornish word for horse). Alternatively, the Cornish word kevelek for Woodcock has been suggested, which would be highly compatible with the wooded river valley in which pheasants thrive today. It's also possible that Cuval or Kevall was simply someone's name". This Landscape document is dated as recently as 2012 by Parsons Brinkerhoff refers (see paragraphs 7.4.6, 7.4.7, 7.5.1 7.5.17 & 7.5.20) to Nanskeval Woods in the Carnanton Estate. In Victorian times, Nanskeval House was the home of Edward Brydges Willyams (1831-1916), three times Liberal MP (twice for Truro, once for East Cornwall), who in 1892 was appointed 'High Sherriff of Cornwall'. He was a keen supporter of Cornish Hurling; he died in Carnanton Manor. We are told that the Estate is still owned by descendants of the same family (as I write in 2018). 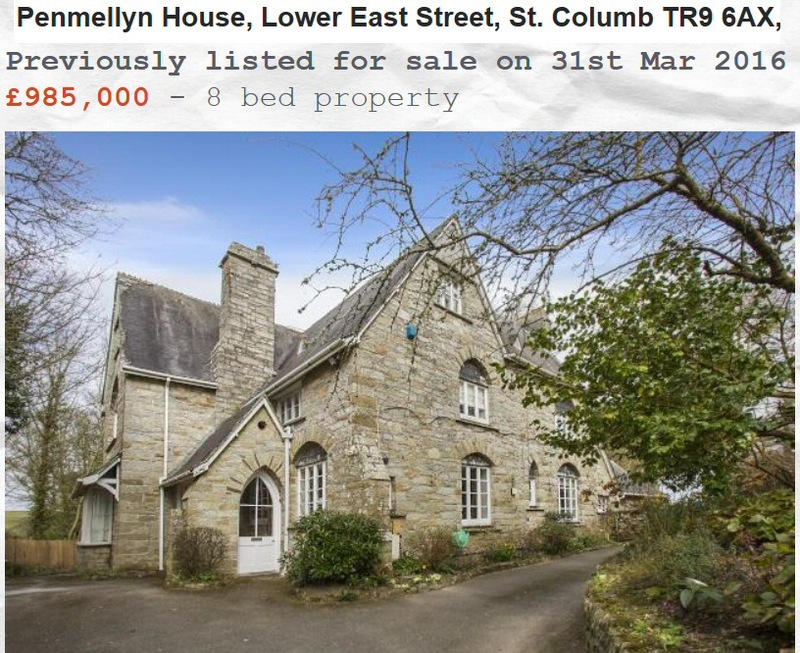 Here is a recent comment on Nanskeval House:- The towns-folk in St Columb Major were not so happy with the demolition since it had been marked as a heritage listed property. The owner, the now deceased resident at Carnanton Manor, apparently thought very little of this and went in on a weekend and bulldozed the buildings. 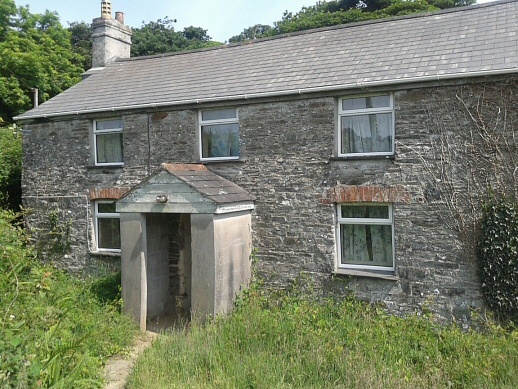 Nanskeval Cottage, St Mawgan, TR8 4EB. Latitude N=50.445o. Longitude W=4.97689o. This is dead right ! Been there !! Photographed it in 2018 !! And here it is - looks quite nice from the front but rough at the back - maybe habitable? There is no road leading to it only several miles of an overgrown fenced-in private trackway. In 2018 the cottage still existed - somewhat close to where the Nanskeval House once was - looking fairly nice at the front but rough at the sides and back. Here - below - is the Nanskeval House before demolition in 1975. Clearly in the Glen of the Woodcocks !! The centre part of the house is the original building, probably of pre-Victorian construction. It had no less than 27 bedrooms but suffered from dry rot. 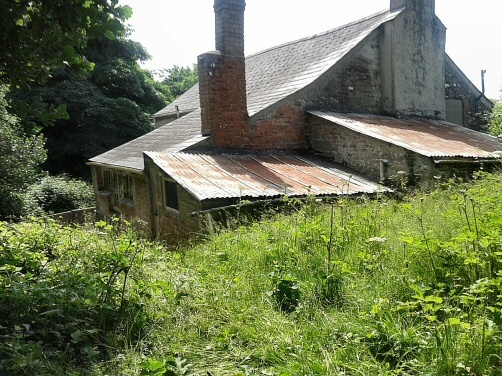 Nanskeval House was on the parish boundaries of St Mawgan in Pydar and St Columb Major. Nankeval House was once the home of Liberal MP Edward Brydges Willyams - desendants of the same family still own Carnanton Estate where the house was and the cottage still is. The then owner of Carnaton Manor wanted it gone so one weekend in 1975 the buldozers went in and down came the ruin. As the crow flies not more than 1000 metres from Nanskeval Cottage was "Lawry's Mill" a water-mill so-called because it was lived-in and operated by the Lawry family certainly back in the 1800s. Authorities list it as "based in Nanscuval" and it "worked on the river Menalhyl" (where else !!). Sometimes it was even named the "Nankivell Mill"
Here is a period photo of it showing its white-washed house on the left, the grey-roofed mill-house, and its mill-wheel on the right, date I think 1820 - 1830. Edmund Nankivell senior was the last Nankivell in my direct line to have been born in Cornwall. He was born on 16 July 1844 and grew up at Penmellyn House, Lower East Street, St Columb Major (Grade II Listed building). "Penmellyn" means "House with the view of a mill" as it was built on high ground overlooking the Menalhyl River (yes !!) in the valley below where there was a working water mill - now fully restored. Penmellyn was built c. 1855 or earlier and his father, Dr John Hicks Nankivell (1809 to 1888) is said by our professional genealogist to be "of Penmellyn". So it looks as if he had it built, and his son Edmund would have been aged about 10 or 11 when they moved in. Our Genealogist has written that Dr John Hicks Nankivell (who lived 1809 to 1888) "of Penmellyn" had, with his wife Elizabeth Amy née Best, six children. Edmund (b. 1844) had four brothers, born respectively 1843, 1848, 1852 and last one I reckon 1854. Three of the four became doctors and moved away from Cornwall but would have lived in Penmellyn until their education was completed. If you click on this link you will see a Youtube film of a plaintive piano piece called "Typpett Nankivell" played in St Columb Major's church. 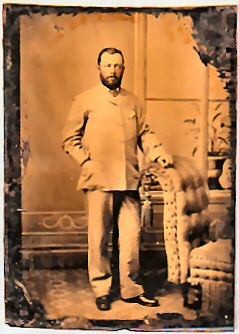 Edmund Nankivell Sr joined the Royal Navy in 1859. His first commission in the Royal Navy began 12/06/1860 when aged 15 years 11 months on HMS Bloodhound. Rank: Master’s Assistant. 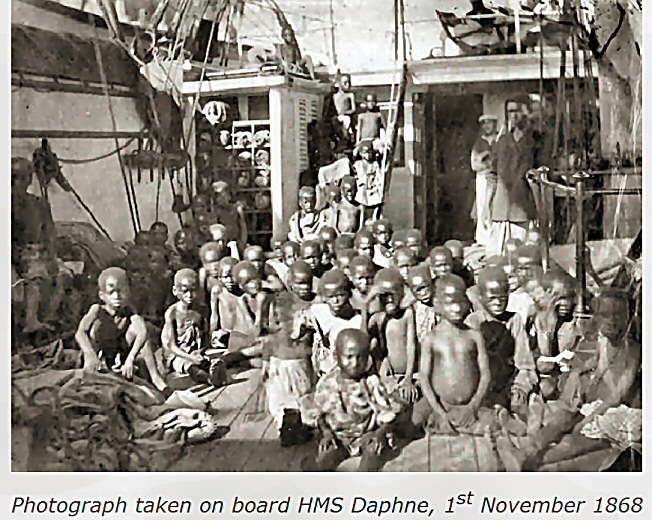 With the Royal Navy becoming engaged in important anti-slavery duties off the East Coast of Africa he had risen to Navigator - people from Arabia were enslaving black Africans, many boys, and trying to ship them to Arabia. He was the first British naval officer to learn Swahili, required by the Royal Navy, because the British had lost their trust in their interpreters during the Navy’s efforts to stop the East African slave trade. By 22/11/1877 Edmund Nankivell Sr had moved to, and settled in, Jamaica because the Moslems had switched to land-routes for moving their slaves, to avoid the Royal Navy. So there was no navigating for him to do there. In Jamaica he documented (published 1882) all the several harbour systems, how sailing ships should navigate in and out of Jamaican harbours - most Jamaican harbours were river estuaries. Then in 1883 he published "Jamaica and the Panama Canal" as work had started on the construction of the Panama Canal in January 1882 mostly using Afro West Indian Labour. No doubt much coming from Jamaica. On the 25th October 1882 - in Jamaica - he married Lilla Agnes Norton, a child escapee from the USA's civil war. His daughter Kathleen Lilla Maud Nankivell was born 6th December 1884 in Jamaica and my father Howard Noel Nankivell was born in Jamaica on 27th March 1893. Edmund Nankivell RN died on the 17th April 1895 in Jamaica, aged 50 years 9 months when the then-incurable Bright’s Disease (kidney disease) took him away. 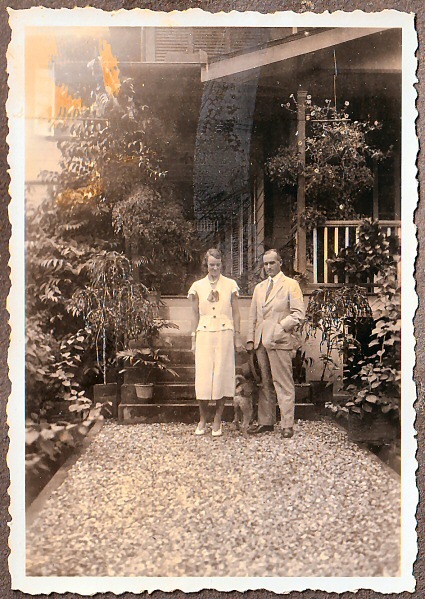 Here is a photo taken in Trinidad c. 1935 of Howard Noel Nankivell and his new wife Florence Nankivell née Muysken. Their daughter Selma was borne there. Howard Nankivell's splendid ahead-of-his-time efforts to improve the lot of Trinidad's locals it well covered in this book by Trinidad historian Brinsley Samaroo. The book The Price of Concience is a very good read, an accurate account of what happened and what should have happened in Trinidad during Howard Nankivell's period there. ISBN 978-1-910553-04-6 published by Hansib. Get it ! Have a read ! Late in 1938 Florence Nankivell did a superb thing - she bravely materminded, arranged and accompanied back from Berlin the very first Kindertransport train, of Jewish children allowed to leave Nazi Germany for Britain; it arrived in Harwich on 3/12/1938 with 200 children - 9 months before war broke out..
Edmund Typpett Nankivell (author of this website) was conceived in Trinidad but born in the Netherlands, although spending a couple of years or more in Trinidad. During the years 1937-1938: as Trinidad's Colonial Secretary Howard Nankivell attacked the way British big business in Trinidad was exploiting their workers, giviving them a seriously hard and unhealthy life, famously once in an attacking speech to Trinidad's Legislative Council. Powerful interests back in London did not like that one little bit so they forced Britain's then Colonial Secretary, at that time a supporter of Nankivell and the very good work he was trying to do, to remove him from Trinidad and down-grade him to Treasurer of Cyprus, then of course also still a British colony. After 3 months in the pen-pushing (he described it) post of Treasure he set out from Cyprus to return to England for Christmas 1938 to be with his family. 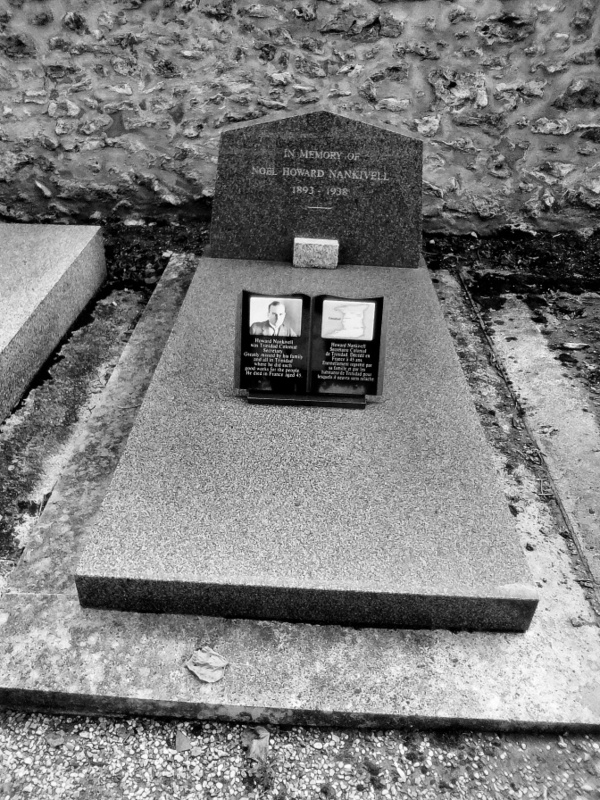 But he was found dead on 21/12/1938 by the railway track in France near St Florentin, fairly close to but before arriving in Paris, and he is buried at the cemetary in St-Germain-en-Laye near Paris. So of course London forced Fletcher to take early retirement and he died in 1954. "Our husbands were ahead of their time" Lady Fletcher was to remark to Florence Nankivell, by which time both were widows. 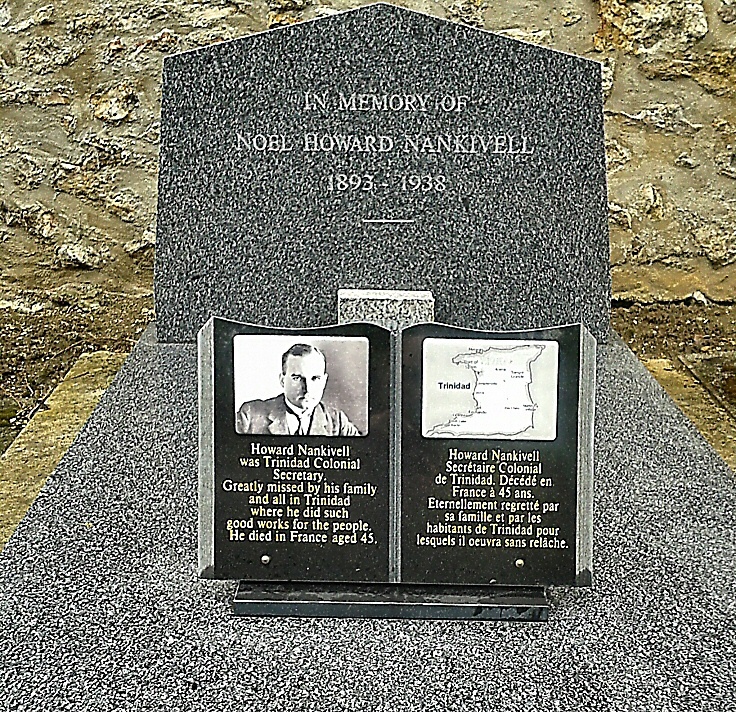 We have renovated Howard Nankivell's grave in France, to the delight of some people in Trinidad ! Some Cornish people still regard Cornwall, not as an English county, but as a British county called Kenow ! The "wall" part of the name, just as with "Wales" refers to the Saxon subtitle for them as "foreigners"
Australian readers might be interested in the book "Australia's Little Cornwall" by Oswald Prior. In the 1980 re-print I have, in Chapter 13 "Industrial Unrest" it seems that miners in Moonta were to go on strike - this was sround1920. (Many Cornish went to Australia as miners of course). There is a meeting at which "Nankivell, the last speaker, wanted to know whether they could go on strike without waiting for permission from the Union HQ at Creswick...when they met again the reply was read out to them <Cannot authorize strike>". This is the only mention of "Nankivell" in the book - which first appeared in 1962. 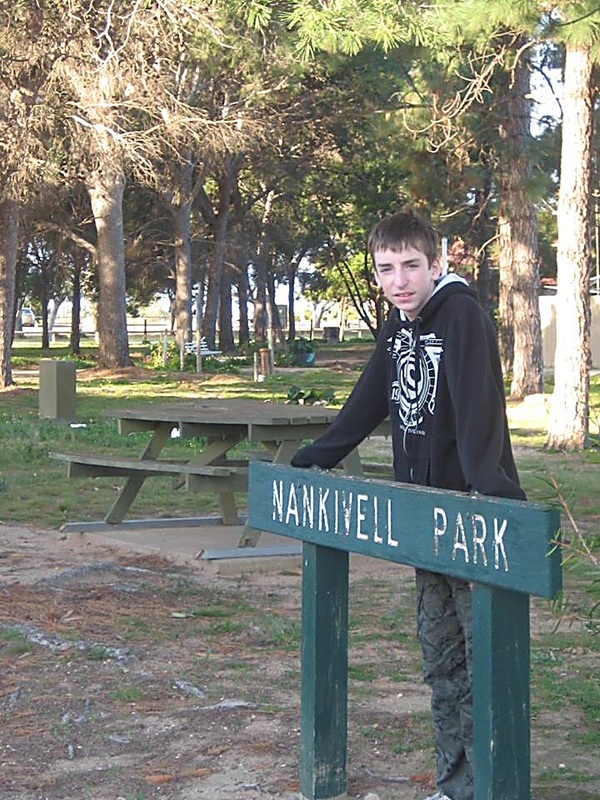 In Moonta there is even a Nankivell Park which inludes a marble arch war memorial to the 34 Nankivells who fought for the Australian military in WW1: one died in action. It is clear that quite a few Nankivells went from Cornwall to Moonta (Australia's Little Cornwall) to work the mines. Left and centre photos thanks to Judy Weggelaar. Both the street and the park named after the Edward Nankivell (son of Edward and Ann) who worked on the railways, Laura Nankivell tells us. Another Australian/Cornish link is in Tasmania where there is a Tamar Valley with a Tamar River. As is well-known, in Britain the river Tamar divides Cornwall from Devon; it rises just 3¾ miles from the north coast to run all the way to the south coast. Furthermore, 1 mile west of the middle stage of the river Tamar, so just in Cornwall, is the town of Launceston. At the head of the Tamar river in Tasmania is a town named Launceston. Still in Tasmania, in addition to the Tamar Valley Vineyards there is also the "Tamar Valley Dairy" producing lovely products. Australia's "Most heroic woman" and "Most decorated woman" was Joice Mary Nankivell (b.1887 in Queensland, Australia - died 1982 in Ouranoupoli, Greece). Her married name was Joice NanKivell Loch. She was a very notable humanitarian worker, also an author and journalist. In 1922 she published the still-available book Ireland in Travail covering the rise of Sinn Fein 1910 to 1921 written by her with her soon-to-be-husband Sydney Loch. Then she did brilliant work with the ethnic Greeks who were forced out of newly created Turkey and in fact she died in the building in Ouranoupolis from where her essential humanitarian work was carried out at a time when Greece was in poverty and could not help financially:- do read her biographical book "Blue Ribbons Bitter Bread" by Susanna de Vries ISBN 978-0-980216-0-0. She had also worked wih refugees in eastern Europe and one of her most brazen efforts was to rescue more than a 1000 Jewish women and children from the Nazis in Poland and Romania. Joice is related to Edmund Nankivell and appears on his genealogical tree. At her funeral in Greece in 1982 a Greek Orthodox Bishop named her "one of the most significant women of the 20th Century". Another famous Nankivell is Reginald Nankivell (1898–1977) born and educated in New Zealand, the illegitimate son of Alice Nankivell, brought up by his grandparents George & Annie Nankivell. As a young man with some money he came to England in 1919 to join in 1925 the newly-formed Redfern Art Gallery, taking it over in 1931 and he made good money as an art dealer. He collected books, periodicals, maps, paintings, prints artefacts etc from 1770 to 1900 mainly about the Australia, New Zealand and Pacific Ocean region including the early history of Australian colonisation. He donated and sold about 5000 items to the Australian National Library, for which he was knighted. He evolved his name to Sir Rex de Charembac Nan Kivell KCMG seeing himself as very European. He also made significant donations to the relevant New Zealand archive.